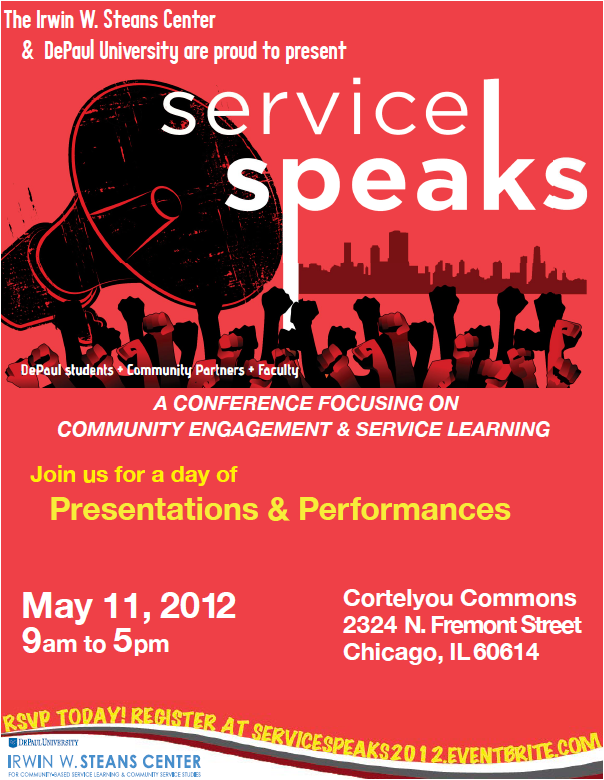 RAGE at Depaul Steans Center – 4th Annual Service Speaks Conference – May 11th!! | R.A.G.E. RAGE at Depaul Steans Center – 4th Annual Service Speaks Conference – May 11th!! Interested in learning more about R.A.G.E., why it was founded, who are the members, and more? Well, plan to attend the 4th Annual Service Speaks Conference which highlights the work of students, faculty and community partners who are greatly impacted by their service-learning and social justice experiences. The day-long conference features, panels, presentations, workshops and posters that reflect the impact of service on critical social justice issues, such as racism, homelessness, living wages, etc. in Chicago and internationally. In addition, the conference features Asiaha (Ay-Sha) Butler, founding member and current President of the Resident Association of Greater Englewood (R.A.G.E). R.A.G.E. represents new leadership within the Englewood community. This resident-funded and resident-led association consists of members who reside in all 6 wards of the Greater Englewood area. R.A.G.E. members are homeowners, stakeholders, business owners, professionals, students, parents and grandparents fighting against the stereotypes that often stigmatize Englewood. Register to attend today by accessing the link below!! Build a Chicago Healthy Food Plan!